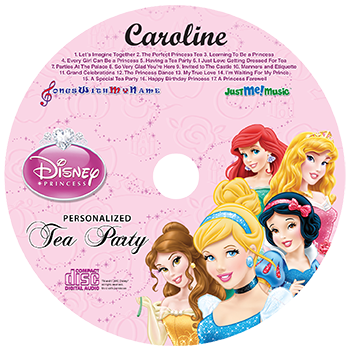 Personalized children's music CDs make the perfect gift for any occasion. 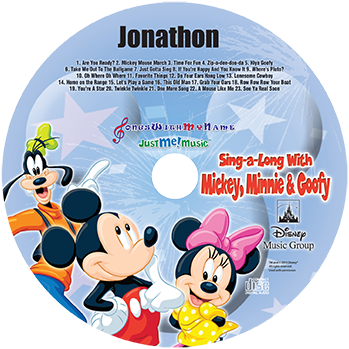 Each of our personalized CDs has 6 to 10 fun and entertaining personalized songs that mention the kid's name 30 - 90 times. The personalized songs have positive messages and help build good self-esteem. The child's name is used in each song to hold their attention as they learn their ABCs, counting, colors, sharing, manners, safety and a lot more. The songs teach children how special they are and that with imagination and determination, they can do anything if they try and that dreams can come true. Personalized Music CDs are FUN! NEW!!! 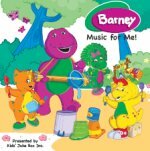 This personalized music CD has 12 original play time songs including a special bonus birthday and lullaby song. We now have 2 Music For Me CDs. Please listen to the samples to make sure you are getting the one you want. Don't go by the picture or the list of songs. Different companies may promote them differently. Our biggest and best personalized kids music CD yet. 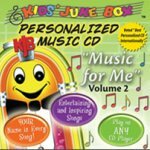 This personalized music CD has 12 original songs that takes your child through a fun filled day from when they first wake up in the morning all the way until they go to bed at night. This wonderful personalized music CD includes a special bonus birthday and lullaby song. Your Child's name is sung in this personalized CD over 90 times! A personalized music adventure for your child that shows them that every activity during the day can be an adventure whether it is going to the supermarket, the pet store or even taking a trip in the car. Volume 2 of our popular Music For Me CD. This personalized music CD has 8 great songs. This personalized music CD is not only fun it is very educational. Your child will have lots of fun learning with 11 personalized songs about going to school, ABCs, numbers, days of the week, seasons, safety, manners, and nursery rhymes. They will have so much fun listening to the songs in this personalized music CDs they won't even realize they are learning. NEW!! Children's love animals and they will love this personalized music CD full of 8 fun and original personalized songs about animals. My Pet Dinosaur, Blue Dog Blues, Fishbowl Bubbles, Barnyard Band, Toucan Can Can, Take Care, Speak Like an Animal, and Good Night. 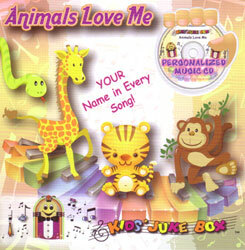 This personalized music CD has 8 original songs about animals. Your child says good morning to the animals and he is reminded how important it is to take care of them and be nice to them. This personalized music CD has 9 original play time songs. Songs remind children how special they are and that it is fun growing up as they play childhood games, visit planet Neptune, discover their super powers, go on a jungle safari and become an engineer of a train. This personalized music CD stresses the importance of imagination and determination. It reinforces that your child can do anything if they try and that dreams really can come true. These upbeat, exciting, and fun original songs use your child's name 106 times!!! You Can Do Anything comes in a personalized DVD too!! This personalized music CD is a collection of 8 songs about a child's daily activity. The CD begins with a morning wake-up song and moves through the day with games and activities, ending with a bedtime or naptime lullaby. All of the personalized songs have positive messages, build self-esteem and teach your child that they are special! Your will love listening to the personalized music and hearing their name in the songs 98 times! Moms will especially appreciate the kids learning to clean up their rooms! This personalized CD is a collection of 8 upbeat pop songs with a positive and motivational message that instills good values to children. The energetic and upbeat personalized songs mention your child's name 79 times! This personalized music CD was recorded by 7 professional Nashville singers and 6 studio musicians. 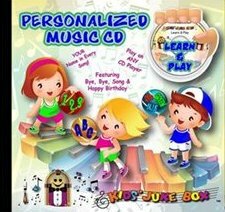 Your child will love to sing, dance and learn with this wonderful personalized music CD. ABC's, counting and sharing are just a few of the important topics that they will learn between waking up in the morning and going to bed at night. 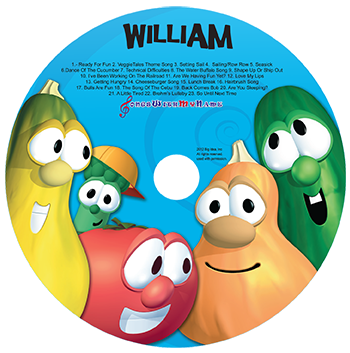 This personalized children's CD has your child's name over 40 times in 7 fun songs and a story. Same 8 great personalized songs from our My Very Own Music English version but sung in Castilian Spanish. What a great way to help teach your child Spanish. Your child will learn quickly because they will already know the words. Same 8 great personalized songs from our My Very Own Music English version but sung in French. What a great way to help teach your child French. Your child will learn quickly because they will already know the words. This beautiful personalized lullaby collection will be one of the most played personalized CDs you will own. Your baby will love listening to these beautiful original and classic lullabies as they settle down to sleep. Hearing their names over 35 times in the songs will be comforting to them and will help build good name recognition. This personalized CD will bring loving memories and security to the older child when it is time for them to go to bed. My grandchildren got this CD when they were born and they still request to listen to it every time they go to bed 5 years later. This CD is a great way to welcome a new baby and it makes a great baby shower gift! Nursery rhymes are even more fun when they include your name in every song! 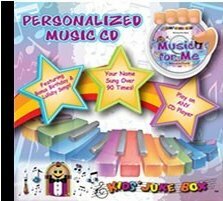 This personalized music CD takes the classic nursery rhymes you remember from your own childhood and combines them with upbeat music, special effects and most importantly your child's name over 36 times! Fun Times Nursery Rhymes are so much fun you might find yourself singing, laughing, and dancing right along with your child. Fun Times Nursery Rhymes comes in a personalized DVD too!! What better way to teach a child about the love of Jesus than with religious music personalized with their very own name. 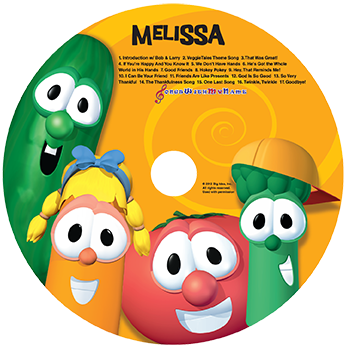 This personalized Christian CD has a combination of original and classic Christian songs that say your child's name over 40 times! Children enjoy hearing their name in the songs as they learn about how Jesus and God loves them personally and will always be there for them. Jesus Loves You comes in a personalized DVD too!! This personalized Christian Music CD has 11 Awesome Christian songs that use your child's name. Hearing their name makes them want to listen to these wonderful songs over and over again. This album is a blend of original and classic Christian songs that reminds children that Jesus and God love them and will watch over them. Formerly known as Awesome Christian Songs. Same great songs with a new name. This CD has 11 classic bible stories and songs, Children will love hearing their name and listening and learning these personalized Christian song and stories they will want to listen again and again. The child's name is used 55 times in this fun filled CD. This personalized CD is a collection of 8 contemporary Christian songs that have been personalaized and arranged to satisfy kids from 6 to 12 years of age. This is an upbeat, energetic and motivating Christian music collection that includes your child's name in the songs 47 times! The music features 3 talented professional Nashville singers and 6 studio musicians. I'm A Soldier is a unique blend of sounds and rhythms that your child will love. The first CD in a series of wonderful bible stories. The songs and stories are told to the child personally and mentions their names a total of 55 times! The characters voices and the sound effects from the biblical times will capture your child's attention as they listen to the stories and songs. The second CD in a series of wonderful bible stories. The songs and stories are told to the child personally and mentions their names a total of 55 times! The characters voices and the sound effects from the biblical times will capture your child's attention as they listen to and experience the Greatest Stories of All Time. The third CD in a series of wonderful bible stories. The songs and stories are told to the child personally and mentions their names a total of 58 times! The characters voices and the sound effects from the biblical times will capture your child's attention as they listen to these wonderful stories and songs. This personalized Christian music CD includes 6 Christian songs for your child to sing and praise God with. These energetic songs with upbeat music mention your child's name 18 times. He is Alive, I've Got The Joy, Hosanna, Praise Him, Books of the Bible and Hug Another Neck. This personalized Christian music CD includes 6 Christian songs personalized with your child's name 34 times! Your child will love singing and dancing to this personalized CD as they praise God. The Spirit of the Lord, Righteousness, Peace, and Joy, One in the Spirit, I've Been Redeemed, and My Father. This motivational Christian music CD includes 6 personalized Christian songs to praise God and emphasize the importance of faith and Christian values. Your child's name is mentioned 44 times in this personalized Christian music collection. River of Life, Faith, How 'Bout You' I'm a Soldier, In the Lord's Army, and Father I Adore You. Birthday's are special and this wonderful personalized music CD full of original personalized birthday songs are sure to be a hit. Your child will love hearing their name sung 58 times in these wonderful birthday songs. This CD is sure to be a hit at your child's birthday party!! Let the party begin!! This personalized Christmas CD has a combination of 7 original and classic Christmas songs that include your child's name. Your child will love listening to and singing these personalized Christmas songs year after year. This CD will become a wonderful Christmas memory and tradition. This personalized Christmas CD has children singing 11 famous Christmas carols while a narrator tells the story about “The True Meaning of Christmas.” This wonderful Christmas CD says your child's name 24 times and is 35 minutes long. This will make a great Christmas gift! This Magical Christmas Story CD with fun catchy tunes will have your child want to listen to it year after year. Your child goes to the North Pole and helps out at Santa's workshop. Your child will go to the North Pole and help Frosty Feathers the pelican save Christmas in this personalized Christmas story. Your child will love hearing their name used 50 times in this personalized Christmas story and it will become a tradition year after year. A personalized Christmas story sung to a fun catchy tune. This exciting Christmas song reminds children of all the fun and exciting events that will soon be happening. Have a very merry Christmas. It's a very special day. Have a holly jolly Christmas because Santa's on his way. This personalized collection of Chanukah | Hanukkah story and songs will bring joy to the whole family as they celebrate the Festival of Lights the winter Jewish holiday. 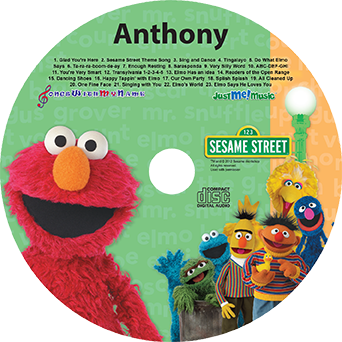 This wonderful personalized music CD was composed and produced for children of all ages and mentions the child's name 16 times. We didn't forget the adults!! Sung with a Man's voice to a woman. Our personalized love songs are made especially for that special someone in your life. Long after the chocolates have been eaten, and the flower petals have fallen to the ground, this gift will provide you with years of romantic moments. Each personalized CD includes 5 heart-touching songs that are sure to set the mood for that special evening. These songs are composed by award-winning and Grammy nominated composer, Harriet Schock. We didn't forget the adults!! Sung with a woman's voice to a man. Our personalized love songs are made especially for that special someone in your life. Long after the chocolates have been eaten, and the flower petals have fallen to the ground, this gift will provide you with years of romantic moments.